It was 10 years ago when Nikki Yeaman and Roma Burke commenced a small online costume business in Brookvale up in the north of Sydney. They named it CostumeBox. I met Nikki and Roma way back in 2007 and from the very beginning, they had a passion and dedication for what they had entered into. Nikki and Roma are both from different backgrounds and have different skill sets, however their partnership has always been rock solid. 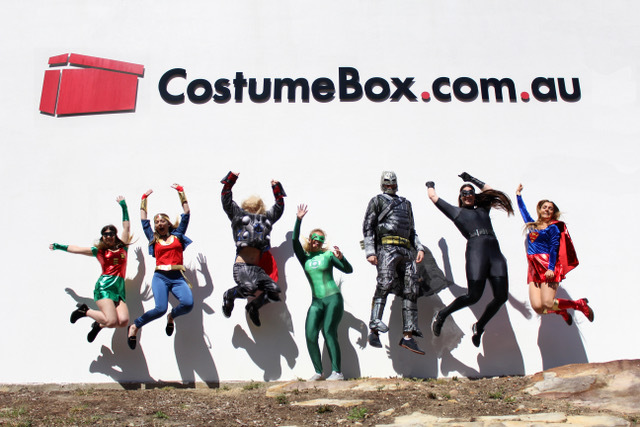 There was little doubt that CostumeBox would one day grow to become the biggest online platform for costumes in Australia! There are not too many businesses that actually plan to grow and then meticulously stick to the plan. They moved into their purpose built headquarters in 2012 and have steadily grown to become the biggest player in their field, offering over 20,000 different costumes, party supplies and fun based products, they regularly dispatch in excess of 5,000 products a day during peak seasonal events. Nikki and Roma have engaged many traditional and non-traditional marketing strategies including PR, radio, on-line chat, billboards and television. They are also assessing the market with the view of possibly offering physical stores. I suspect that their greatest asset has been understanding their customer and then delivering an uncompromising level of service, which provides them with a huge competitive advantage. They have big plans to continue to develop and grow their business over the next ­­­­three years and we met them recently to discuss the business and their plans for the future. I am interested in how you view the concept of developing an idea such as CostumeBox. To achieve the scale you have been able to achieve in the business, how important was the initial planning and execution component to the end result? Careful and detailed planning has been vital. To achieve our current scale a lot of fairly complex elements have had to come together and work seamlessly. Too often we have been at what our tech people call the “bleeding edge” of implementing new technologies, and that’s what it’s felt like! All the greatest ideas in the world are useless without effective execution, and so having a fantastic team around us and never losing sight of our goals has meant we have always eventually achieved the milestones we set for ourselves. You have always pushed the barriers in terms of being ahead of the curve when it comes to developing an inventory system, introducing online chat for your customers and 24-hour delivery models. Have these initiatives fast tracked your growth? Not so much fast tracked as just made it possible to grow at all. The inventory system is key to a stock driven business like ours. Once you can’t count your inventory manually in one day, I think a sophisticated inventory system is essential. Poor stock control could kill a business like ours quite quickly and in a multitude of different ways. In terms of online chat and overnight delivery, we are just always looking for the best outcome for our customers. We take inspiration from leading fashion sites like ASOS, The Iconic and Net-a-Porter as leaders in customer service standards. There has always been a great synergy between you in marketing and Roma handling operational matters. What is the most valuable strength that you each bring to the business and where has that added the greatest value? It’s a situation where the sum of the whole is greater than the sum of the two parts. It’s fortunate that we do have different strengths and work so well as a team. Our goals have always been aligned and I think that is key. From a marketing standpoint, I don’t believe there is anything that you have missed including PR, billboards, television, radio and gift-with-purchase. Can you provide us with a little insight into your next big marketing innovation? We aim to expand CostumeBox to be wherever our customers need us to be, so you could say that real estate is the next aspect of our marketing strategy. Where do you see online retailing heading in the next three years with the recent changes in this space? I see it all just as retail. I think for most big retail brands it’s no longer a matter of being a website, or mobile site, or bricks and mortar or a social media driven platform anymore. I think good retail in the future must have all those elements working together seamlessly as natural touch points of the retail offering to consumers. I believe you set out to become the best costume and dress up business in the market. As it has turned out your platform has developed to include Costumes, Party and Fun. Can you tell us a little about the Party and Fun part? Sure, it’s all about our customers’ needs and wants. If a little guy or girl (or a big one) is so into Harry Potter that they want a Harry Potter themed party, then as well as buying the costume, it’s going to be very convenient to be able to buy the branded Harry Potter party supplies, as well as a branded gift like a Harry Potter Trivial Pursuit game or Harry Potter Bobble Head as a gift too, and have it delivered all at once for free. We understand you also recently launched an online platform to sell into the United States market. Is this part of your global strategy? Yes, we do have a US website which is doing well, but we are dipping our toe in gently and are aware that it is a very different market and we have a lot to learn there. The main focus of our growth over the next 3 years is still Australia though. We still see a great-untapped opportunity to better serve Australian consumers. Where do you see CostumeBox in 12-months time? Roma, you are 10 years into your CostumeBox journey. What has the evolving team at CB meant to you both along the way? The team is an integral part of CostumeBox’s success, nobody does this on their own. We are now a group of teams responsible for different functions within the business; each team with their own great team leaders and that has been key to enabling our growth. It has been very rewarding to see many staff develop over the years that they’ve been with us, and to now be able to offer these talented people professional development and a rewarding career path. CostumeBox stocks in excess of 20,000 costume, party and fun products. What systems are required to professionally manage such an extensive range? We were early adopters of a very sophisticated enterprise resource platform and that has been key to being able to successfully manage and grow our range. Our system allows us to have real time visibility on our entire inventory and indeed our entire operation. The data we can pull is extremely granular and the historical data is key to accurate forecasting and management. You have invested heavily in customer service and provide a best-in-class experience for your customers. Has this provided you with an advantage in such a competitive marketplace? I think it has. Some of what we class as customer service is simply part of our company architecture. Fast delivery is one of the cornerstones of our model and we are constantly striving to improve our delivery offering. The other aspects of our customer service model are cultural within the company. It sounds trite but the customer is always our primary focus and we put their needs front and centre of all our decision making. Empowering our customer service agents to resolve any customer problem in the first contact is also one of our core service standards. How have you managed your steady growth over the past 10 years at CostumeBox? Well, I don’t mind telling you it has been hard! And as they say “Rome wasn’t built in a day.” I would say it has been a mixture of being willing to take risks, but also put detailed planning and preparation around our plans to mitigate those risks as much as possible. On top of that, I would say tenacity, and bloody hard work has been important. The CostumeBox branding goes right down to your shipping boxes and satchels; do you have a read on the level of recognition for your brand? Not a scientific one, but we have invested in marketing our brand over the past 10 years and now we feel it is at a stage where we do have a recognisable brand. Anecdotally these days when someone I meet for the first time asks what I do, they always seem to have heard of us, if not bought from us recently. Our original goal for CostumeBox was to be the first company that came to mind when you needed a costume. We do feel we are getting close to reaching that goal. What’s the most challenging task from an operational standpoint to keep the business performing? Recruiting the right team would have to be the most challenging and most important part of operations. Maintaining the quality and quantity of talent needed for an operation like this in the virtually full employment environment we operate in on the Northern Beaches of Sydney is a constant challenge. Also with a business as seasonal as ours, keeping the company culture strong and cohesive with a huge influx of casuals every year is a challenging but rewarding mission. We are lucky to have an amazing team of talented and committed key people but we are always on the look out for the next star. How has your website evolved over time and how do you rate it on a global basis? It’s constantly evolving and we are always looking for ways to improve the customer experience. There would not have been a single month in the past 10 years when we weren’t working on some new feature or improvement to the web or mobile site. We are currently going through total redesign number four, with an entirely new platform, due to be launched early 2018. How efficient is the back end of your webstore? As efficient as the front end, it’s just as important. With out it, we would not be able to fulfill our service promise to our customers. Has the gift-with-purchase platform delivered growth? It’s become a key part of our marketing and conversion strategy and customers react very well to it. It’s important to make sure were offer a quality item and keep it relevant, useful and valuable to the customer. Thank’s for your insight Nikki & Roma, we appreciate the opportunity to speak to you about your business!